Keeping up with Landree: We're home! What a great trip! It was way too fast, but not as hard to say goodbye since my parents will be here in a few weeks (for Thanksgiving) and we'll be home with all our family and friends in just about a month!!! I love this time of year-we get to spend so much time at home! The walk was so wonderful! Megan and I had a great time and the cause is so close to my heart! We walked about 30 of the 60 miles (Did I mention Megan is 15 weeks pregnant? She was such a trooper! A little sore, but a great sport!) Megan's mom and mother in law are both survivors and it was really neat to have her mom and niece along with my mom and Landree to come cheer us on Saturday afternoon. I have so many stories to tell and pictures to post-I still need to catch up on Halloween, our trip, and now the 3 Day. Here is a picture of our first morning before we started walking. It was about 5:30 am. Momma took Landree to have her pictures made on Friday morning. Cassy at Glam it Photography, takes the neatest pictures. I can't wait to see them. She was sick over the weekend and wasn't able to edit them before we left, but she did post this on her myspace account as an advertisement to book Christmas pictures. I can't wait to see the rest of them. Thank you so much for all of your sweet messages and letters you sent me about the walk! I really appreciate it! I can't wait to catch up with all of you-I'm going through withdraws. I didn't check my email or blogs for 4 days in a row! I can't wait to hear more about your trip. Megan was a trooper! 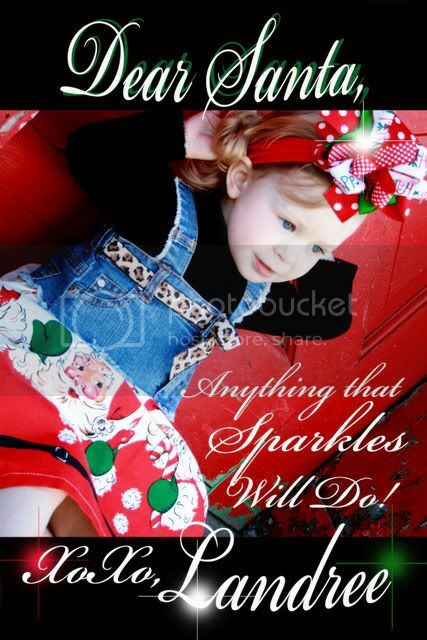 I love, love, love the Christmas picture of Landree! It couldn't be any cuter! I am glad you had such a good time! Congrats on doing such a good job at the walk! Oh Jen, I am so glad you are back home safely and that the walk went well. She was 15 weeks pregnant and walked 15 miles??? Wow! Very impressive! Hope your little princess is feeling better. Jen, so glad you had a good time! I thought of you often and prayed for you...it's no small thing! And since your walk was on the heels of my 3Day experience...it was easy to think of you walking! Glad you had a good trip. Relax and give yourself time for a hot bath! I can't wait to hear all about the walk. You go girl!! !